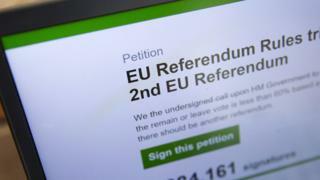 An online petition calling for a second EU referendum has been hijacked by automated bots adding false signatures. Posts on the 4chan message board indicated that some users had scripted programs to automatically sign the petition. Thousands of signatures appeared to have come from people in Vatican City and Antarctica. The House of Commons petitions committee said it had removed 77,000 signatures and was investigating. The petition currently has more than 3.6 million signatures, more than any other on the parliamentary website. Thousands of signatures from countries such as North Korea and the South Sandwich Islands have been removed, and a majority of the signatures now appear to come from the UK. But many could have been added by automated programs called bots and the petition continues to gather hundreds of signatures a minute. "With any online property that is designed for interaction, you need a mechanism in place to defeat automated means of adding content," said Rik Ferguson of computer security firm Trend Micro. "4chan is famous for this sort of mischief - and if websites don't have systems in place, they will get abused." The government's petitions website does not appear to have a system in place to detect bots - such as a "captcha" picture that asks a user to recognise letters and numbers in an image, a task which is more difficult to automate. "It seems like a huge oversight for a website designed to be used by so many people to lack simple protection," said Mr Ferguson. Some members of the 4chan message board have claimed responsibility for the hijack. "I voted 33,000 times. Left a script running while I was taking a shower," wrote one member. Prime Minister David Cameron has already said there will be no second vote. The House of Commons petitions committee has said it will continue to monitor the petition for "suspicious activity".